Most care is delivered by you looking after yourself in your own home with your family to help you. Most families usually have one person who tends to look after everybody else in the family and make sure your health needs are in order too. 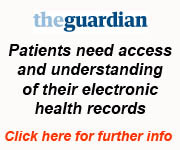 So it makes a lot more sense for you to be able to see what is in your electronic health record so that you can look after yourself better with your carers and ourselves to support you. Why wait until there is a problem when you can do this now and also encourage your loved ones too and family and friends who are patients of ours! It's free, takes 2 minutes to complete the Records Access and Understanding Checklist Questionnaire and gives you a feeling of control over our healthcare needs and a lot of fun too! Our aim is for all patients to be able to do this. You can also easily set up reminders for taking your medication or keep a record of your blood pressures or other parameters or keep your one notes if you like using the Evergreen Life PHR app. Please send an email to htmcpatient@nhs.net if you are experiencing any problems or want help with getting online and need your pin numbers to register online or ask to speak to one of our receptionists who can try to help.